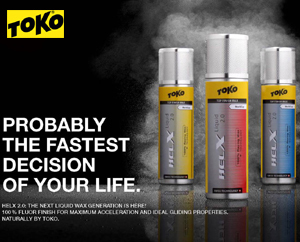 There are three scenarios for Toko grip wax (hard wax). Always when grip waxing, do your first few layers over the entire length of the kick zone and the last layers only in the middle (working your way shorter and shorter). The first is if the snow is normal powder snow or skied in powder. Go with a thin layer of Base Green (ideally heated in and smoothed) and cover with multiple layers of the wax of the day. For example, it could be Red covered by Blue or just Blue straight depending on the conditions. You could also have a strip underfoot of warmer wax. The second is if the snow is partially transformed. In these sugar snow type conditions, straight Base Green applied short (klister zone) and thick (depends on how difficult the conditions are to kick) is generally the best. This should be tested against straight klister and klister covered, but Base Green will probably win. (In truly transformed snow, klister will be the call). The third is if the snow is in between the two conditions given - partially transformed abrasive snow with powder mixed in. In this case, apply Base Green then the wax of the day (probably Mint or Blue), then Base Green, then the wax of the day, then Base Green, etc. 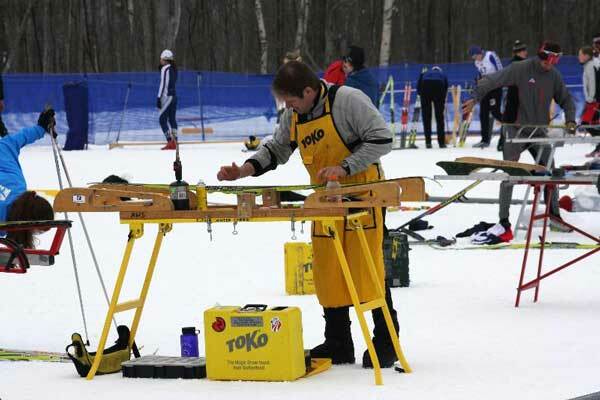 Start applying on the full length of the kick zone and work your way shorter after a few thin layers. End with a layer of the wax of the day. Make sure that the multiple layers are thin and stay smooth.